The 200 meter sprint is the Rodney Dangerfield of the sprint events. It gets no respect. 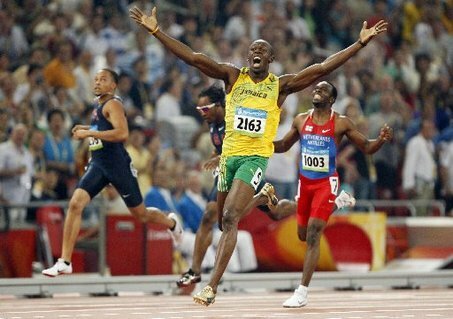 When we commonly think of the sprint events, the 100 meter dash gets all the glory and the 400 meter dash gets all the respect. That leaves the middle child, the 200, left out in the cold. As an athlete whose primary event was the 200 at the collegiate level I’ve developed a certain affinity for running and coaching the event. While I’ve arguably had the most coaching success at 400 meters (and, where I’m from – the 300) I still love the Deuce best of all. In this article I’m going to break this event down so that your athletes can find greater success in the event. Because a solid 200 meter runner can run the 400 (open and relay) and likely can drop down to the 100, or at least run the backstretch of the 4×100 (generally the longest leg of the 400m relay). As you read this article, I invite you to think of questions and bring them to the discussion forum. Before I dissect how I break up my macrocycle, let me first explain the simplest way to teach your athletes to run the race. The main problem with inexperienced 200 meter runners is the fact they run the race like it’s the 55, i.e., they try to sprint the whole thing. The reason so many athletes get run down in the deuce is because they treat it likes it’s a race to the straight away. It’s not possible to all out sprint the 200. There has to be a conservation of energy somewhere. Remember, athletes get run down not because the competition is accelerating past them, but because they are slowing down much faster than the competition. Top speed can only be maintained for a max of 2 seconds before deceleration begins (why even the 100m can’t be run all out). So, at best, 200m runners are going to start slowing down by the 60m mark. By the time they’re coming off the turn, of course they’re going to start rigging up. All that being said, this is how I teach athletes to run the 200. It has worked quite well for my athletes. You have to teach athletes they must float during this time no matter what is going on around them. It’s tough when the other athletes are burning the turn, but that just gives your athletes someone to run down when they start tying up at the same spot yours start to bare down. This is a learned skill and we practice it specifically starting late week 6 or early week 7 through the rest of the season (see below). We know that’s not what’s actually taking place, but that is what it should feel like. Have athletes ‘re-accelerate’ to full speed over a distance of about 20m. Focus on driving the arms down and back and applying force to the ground like they were starting from a dead stop. Relax the face, Relax the hands, Relax the shoulders. They want to try and outrun themselves over the last part of the race. But straining is the kiss of death. They have to run here with maximum speed, but minimum effort. Sounds like an oxymoron, but it’s the key to the finish. I have found, with a few modifications depending on the athletes running style and physical strength levels, that this is the best way to learn how to run an effective 200 meter dash. Now, how do we build the skills that maximize the effectiveness of all of these phases of the race? Most athletes who will run this event in big meets are going to be 100/200 runners or 200/400 runners in practice. In our programs, we have always divided the training groups, generally, into these divisions based on the skill sets of the athletes and for time management purposes. An athlete who is concentrating on the 200 will spend 80% of their time in the 100/200 group and 20% of their time in the 200/400 group. As a ‘tweener’ event, you have to consider a few things. First, during Championship Season, 200 meter runners are going to have to run rounds. Depending on where the athlete lives, that could be anywhere from 2-4 races over the course of the day. This has to be considered from the start of the season. A bad first or second round race can stick an athlete in Lane 1,2 or 8. And that is a tough spot for a young athlete to advance in later rounds, let alone win. Even worse, I’ve seen countless poorly prepared, highly seeded 200m runners run a banger of a semi-final. But once they got into the final, they were spent and faded coming off the turn. That is why I’m a firm believer in the idea of having 200m runners race at 400m earlier in the season, whether in the open event or the relay. And usually both. At the same time, the pacing is not nearly as controlled as in the 400. So acceleration, maximum velocity and speed endurance are at a premium in this race, whereas a pure 400m runner can get away with less skill here. Thus the open 100m and 4×100 are excellent ways to prepare for this distance. The good thing is that athletes will have many meets to run all these races and prepare for their end run. Because there are so many dual meets, relay meets and smaller invites early in the season, you can enter the athlete in events at your discretion. Generally, I follow the flow of their training schedule. During this time we’re going heavy on the acceleration development, speed drills and mechanics. We’re also going to start in the weight room immediately and focus on improving work capacity and pillar strength on recovery days. We’re doing 2 days of low intensity, double leg plyos. They’ll likely spend one day per week with the 2/4 group (through the whole season) and perform a rep or two of short end Special Endurance II or long end Special I.
I know that once the season is in full swing, with many 2 and even 3 meet weeks, we’re not going to be able to do a ton of formal training. So building a ‘base’ is important now, just not a base of excessive low and middle intensity training. We’ll probably have our first competition at the end of this period. Ideally, I’ll run the athlete in the 100 and 400 or 100/4×4 plus field event/s. Trust me I understand that most times athletes run what you need them to run to win meets. During this mesocycle, things are starting to get a little bit more specific. We’re still doing the things we did during the first 3 weeks, except I’m reducing the volume of tempo work on recovery days and I’m moving from 2 days per week of speed to 3 days over the 6 day schedule. I’m also transitioning to single leg plyos only if athletes have proven themselves. Now I’m adding maximum velocity work (fly 30s – 40s, sprint/float/sprints), working out of blocks and starting to work on running the turns. We’ll also move from Special I runs to some long Speed Endurance runs at the low end of intensity (90%), most likely with the 200/400 groups, assuming their speed work is on schedule. In meets they’ll see their first open 200. In this time I like the 200/400 double and probably a 400/4×4 double toward the end of the cycle as things will be getting much crisper and faster in the coming weeks. This is the hardest part of the season from an energy system and psychological standpoint. Kids are sore, they can smell the end of the season and they’re running lots of meets. On recovery days and days where you’re competing, say, Tuesday/Thursday or Wednesday/Saturday you have to break the monotony of doing the same old thing, especially since there isn’t the possibility of getting in a workout. That’s when I break out the movement based games. Ultimate Frisbee, speed tag, split the cone and other games are really fun and your athletes will request them on the next recovery day. It can breathe new life into a long season. We’re now getting to the early stages of the part of the season my athletes call ‘Fun Track’. Fun track is when we’re not doing tempo work or GS circuits every recovery day, but we’re still doing aerobic capacity work and GS work. Practices are shorter and contain less drills, reps and exercises. The weight room is still going strong (3x per week), some athletes have graduated to single leg bounding drills and they can hold Swedish Ab (plank) positions for a good 2 minutes before threatening to kill you or quit the sport forever. We’re doing fly 40’s and Speed Endurance transitioning from the turn to the straightaway. Blockwork is taking place on the turn from all lanes and we’re learning to how to drive for the 5-6 seconds out of the blocks before going into a float. We’ve mostly left ‘intervals’ behind us in favor of ‘reps’, meaning that our rest periods are much longer, we’re doing far fewer total runs and all speed days require spikes. Athletes can now hit their times within a tenth or two in either direction and can generally tell you what their workouts should be (if you’ve taught them well) and by week 8 they aren’t complaining about feeling so ‘heavy’ all the time. In meets, athletes are running more open 100s and 200s. The 4×4 is still part of their lives, generally at least 2/3 meets during this time. True ‘fun track’ has arrived. The League Championship or first major meet is just a week or two away. Recovery days consist of extended warm up routines and a few strides. Non-CNS days are done in 45 minutes and people either take off right away or stay to socialize. Athletes are smiling in the warm weather and talking about where they’re going to be seeded for the upcoming championship meets. There’s a good chance there’s a few seeding sheets going around and people are talking about the PR’s they’ll run and how their relays will do. Speed work is all full recovery and you generally let athletes run when they’re good and ready. Additionally, speed work is all various elements of race modeling – The start and drive phase, floating the turn, the transition from the turn to the straight or sling shotting the turn, lifting over the last 50meters and even learning how to time the lean at the tape. We’re still in the weight room of course. Generally we’re in there until athletes start to peak. Some athletes prefer to keep lifting a couple sets early in the week of a major meet, others don’t. You’ve either prepared your 200 runners to get through the rounds and run a good relay leg or you haven’t. But there’s nothing you can really do about it now. Meet events are all business and athletes are trying to prime themselves for a big PR at their biggest meet. So they’re running their post-season events now. If you follow this general format for your season, the timing of your progressions should all come together at the right time. Of course, this is all dependent on your writing your athletes’ training plan starting from Week 12 and working backward to Day 1, Week 1. You have to know where you want to go before you can figure out how you’re going to get there. But by teaching your athletes how to run the race the way I suggested and following this general outline, your 200 meter sprinters will run their Personal Best.